Koss Porta Pro review | What Hi-Fi? Yeah, we thought the same thing. The Koss Porta Pro headphones aren’t meant for anyone who cares about sound quality. These are for Quentin, a self-professed 21st-century Kerouac, listening to his own bedroom techno remixes on a Walkman, gleefully oblivious to how awful it sounds because at least the headphones are as quirky as he is. For only £25, he can afford a pair using the travel allowance from his games design internship. But Quentin doesn’t deserve these headphones. Nor does anyone buying them merely as a retro trinket. Those people frankly don’t merit the amount of fun they’ll have listening to the Koss Porta Pros. The fact they look like they are from the 1980s is precisely because they are. Koss introduced the design in 1984, and their longevity is testament to their sonic performance – this wasn’t always the trendiest of looks. The design keeps them lightweight, ideal for commuting or using while you exercise. You can toggle between a light or firm fit – though firm does not mean clamped – as well as collapse them down to fit tidily in your bag. The only potential concern regarding the Porta Pros’ design is that they’re pretty much open backed, meaning you may have to dial down the Europop if you don’t want your embarrassing tunes to be heard by the whole room. Everything pertinent to build and design you could essentially glean from looking at a photo, though; what we’re really here to tell you is how great these headphones sound for such a tiny sum of money. 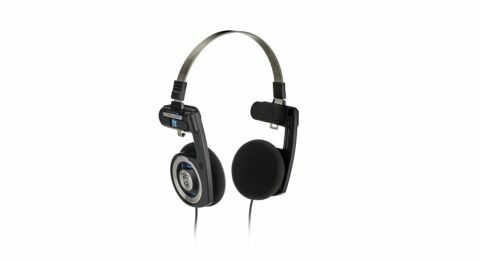 At under half the cost of our cheapest Award winners, the AKG Y50s, there are inevitably going to be compromises made in certain areas. As far as we’re concerned, Koss has chosen correctly in that regard. So no, there isn’t the absolute detail comparable to the sub-£100 class leader, but why would there be? Koss has put its energy into … well … energy. It’s seemingly the most difficult aspect of a presentation to get right – considering just how many products at all prices we hear getting it wrong – but timing is absolutely these Porta Pros’ forte, and the rhythms they deal are done so with an infectious vivacity. There’s also a surprising amount of bass weight, without skewing or muddying the balance, and while their treble is perhaps not the sweetest we’ve ever heard, it is far from coarse or distracting. That isn’t to say these headphones shine only when presenting upbeat tracks. Dynamic range is eternally entwined with rhythmic sensibility, and the Porta Pros are able to detail expression just as they are driving a beat. It’s the kind of sensitivity that, while not perhaps hi-fi ready, elevates them beyond the realm of ‘they’ll do’ and into that in which they could happily be our main headphones for on-the-go listening. If your budget stretches further, we’d still suggest opting for the AKGs: they’re a more serious sounding product that improve on each element of performance – as headphones more than double the price should. But we could easily foresee many current Y50 owners rustling up £25 to own a pair of both. The Porta Pros are easily more portable, as the name suggests, and certainly are of a preferable build for running around. We don’t dish out five-star reviews simply due to a market bereft of competitors, nor even because something is decent ‘for the money’. If you want a cheap pair of frills-free headphones that get to the nub of a performance, the Koss Porta Pros are a product we can fully get behind, and have a lot of fun while doing so.